We are all aware that the role of rooftop cargo carriers is to utilize the bare space that the vehicle’s roof has. Companies started to enhance these carriers to be more durable and heavily constructed, thus, giving birth of hard shell rooftop cargo carriers. This type of carrier is functions just the same as the normal ones; the only addition to this is its hard shell cover. This property boosts the security and durability that predecessor models have, making this more popular among people who love traveling. When buying a hard shell rooftop cargo carrier, it’s very important that you pick the best one (for you) right away as this equipment is pretty expensive. To guide you more, here are some things you’d want to consider before placing any purchase. Determine the things that you want to carry in the cargo box. What types of gear are you bringing along? Match the box size on the required space for your belongings. It’s always a good thing that you list the things down so you stay on track. Your cargo box should fit on your vehicle roof. Additionally, learn the weight capacity of your roof rack to avoid any trouble. Companies are offering cargo boxes of different shapes. It’s always best to choose a sleek and aerodynamic box as it helps reduce wind impact on your carrier. This extra large cargo box provides 18 cubic feet of waterproof rooftop storage, which is perfect for oversized and bulky items. It’s specifically designed to be aerodynamic while being spacious at the same time. The box features compatible rack configurations including SportRack roof rack systems, square, round, and other factory racks. It’s constructed from ABS plastic, providing resistance against sun, rain, and impact strikes. The box assures easy attachment to and removal from the car’s roof with the use of U-bolts. Vinyl hole covers are also included to protect the box and its contents from unpredictable weather. Security is provided as the box has a side opening lid that automatically stays open for easier usage. In addition, it has a lock cylinder integrated on the opening, securing the contents and locking the box on the car roof. The lid twists, making it hard to open and close. The hinges were not that great. The box might need some modifications to fit some cars. 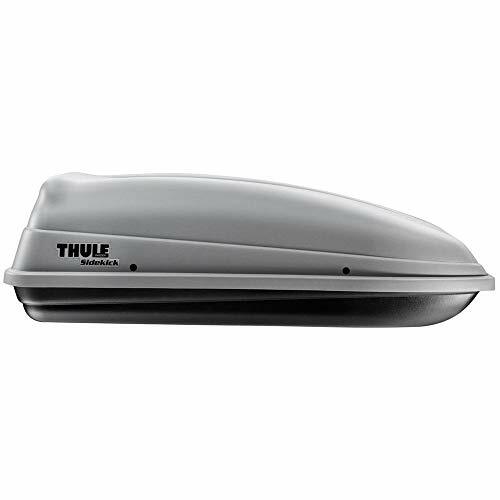 Thule’s hard shell rooftop cargo carrier provides 8 cubic feet of storage. It’s really convenient to use at it can handle up to 110 pounds of cargo, ideally camping gear or sports equipment. This roof cargo box is made of ABS plastic, providing a high level of durability as it is UV and impact resistant. It has wide rack compatibility as it can be attached to Thule base racks and most factory racks. The box uses U-bolts or knobs to make it easier to install. Security is assured as the product comes with 2 locks to secure the contents and to lock the cargo box to the carrier. Thule provides a limited lifetime warranty for this unit, including the straps and needed mounting hardware. 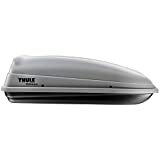 Thule’s cargo box ensures that it provides a spacious interior and convenient usage. Durability is guaranteed as it’s constructed of 5-layer ABS plastic. This hard shell rooftop cargo carrier comes with a quick-grip mounting hardware that makes it easier to attach it on and remove it from the car’s roof. The box’s lid features a dual-side access, making it convenient and easy to get your belongings from either side of the vehicle. This product measures 64”x 34”x 16”, making it the largest roof cargo box on this list. Easier and faster installation with its tool-free mounting capability. The lid is hard to close when it’s opened both sides. It’s a bit flimsy when opened. The lock mechanism is not that smooth. 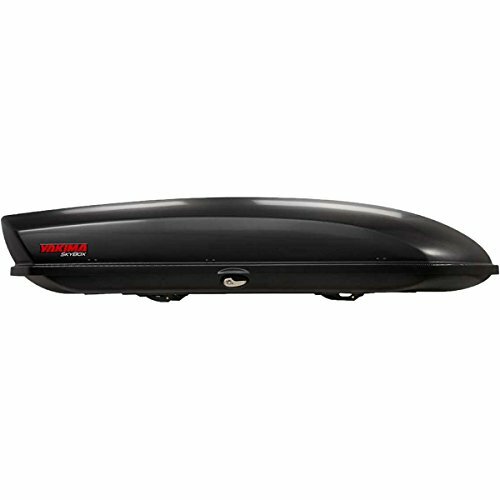 This SportRack box provides 11 cubic feet of rooftop storage with an aerodynamic design for more convenient traveling. It’s specifically designed to be widely compatible with different rooftop racks. This roof mounted cargo box is made of ABS plastic, providing a high level of durability and long-lasting usage. The SportRack cargo box uses a patented Easy-Snap mounting hardware, enabling easy installation on the car’s roof. Additionally, U-bolts are also used. The box comes with a lid that’s placed on the passenger side. The lid automatically keeps opened for easier loading and unloading. When not closed, a waterproof seal is created. The company provides a limited lifetime warranty for this product. The Yakima box provides spacious storage of 21 cubic feet. The box’s Carbonite textured lid ensures content protection against sun, rain, and impact strikes. 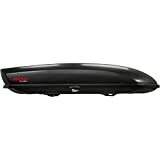 Its sleek and aerodynamic design guarantees added convenience and a classy look. The box is easy to attach to and remove from the car with its tool-free installation system. Rack compatibility is not a problem as the Yakima cargo box fits on most factory racks. This model is aerodynamically designed to make the cargo bag perfect for SUV, trucks, and other small vehicles. The dual-sided opening of the lid enables access from either side of the vehicle. Additionally, the push button security makes sure that the lid is secured, together with the contents. The box is designed to have a wide range of rooftop compatibility, fitting most rack systems. Certain ski equipment can’t be put in the box. This box provides 16 cubic feet of cargo storage. Ideally, this can fit 6-8 pairs of skis (max. length of 178 cm), or 3-4 snowboards. The lid has a dual-side opening that allows easier access from either side of the vehicle. It flops a bit when empty. The box provides storage space of up to 14 cubic feet and a weight capacity of up to 110 pounds. It’s constructed with ABS plastic material for high durability, added content protection, and longer usage. its SecureLock System ensures that the lid is securely closed and the contents are safe. The Easy-Grip mounting makes it easy to attach the bag on the rack. As you can see, the choice is vast. You can, of course, find more options by simply searching the web or going to Amazon. However, this article is meant to be as a shortcut for you simply because we have included the best-selling hard shell cargo carriers with the highest feedback rates. Some people use cargo carriers literary every day while others use them occasionally. In any case, if you decided to invest money into this purchase, you want to be sure it will last for years. Therefore, the best way to go is to choose a product which is already tested by other people and given a great feedback.